Whether you’re concern about the environment or you just want to save a few dollars, owning reusable grocery bags is a wise decision. Although they might cost more than plastic bags initially, you won’t regret investing in them. Now, if you don’t own one yet, then this list is good news for you. Check out each item to find the best reusable grocery bag for you. 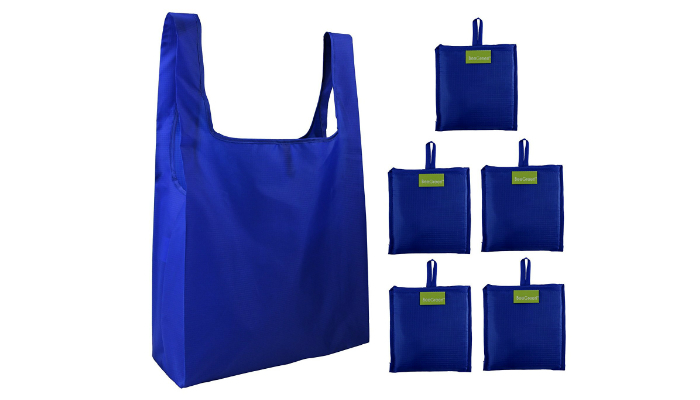 Simply Green Solutions Reusable Reinforced Handle 10 Pack Large Grocery Tote Bags come in various colors to make you even more excited before shopping for goods. They do not have a single print on any surface so you can personalize them if you are the artistic type. Their reinforced features consist of handles attached to the external walls through durable stitching, and a stiffener inserts at the bottom base which can be removed if you want. Aside from containing groceries, these reusable grocery bags can also serve as decorations for craft projects and kids’ art activities. That is mainly because of this product’s affordability, simplicity, and multiple quantities in just one pack. Interestingly, these bags are machine washable. More importantly, they truly follow the main purpose of reusable grocery bags due to their composition. They are simply composed of recycled polypropylene. 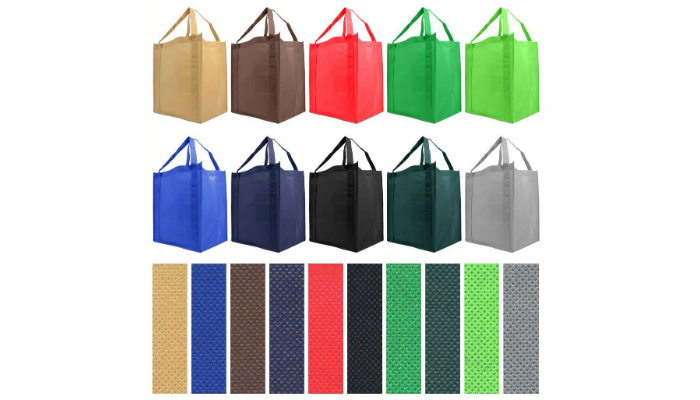 BeeGreen Set of 5 Foldable Reusable Washable Polyester Grocery Tote Bags are made of a tough yet lightweight material called ripstop polyester cloth, which is considered to be the best fabric for grocery bags. The main reason behind the material’s popularity is its resistance to rips. You will probably never lose one of these bags because each comes with its own integrated square pouch so you can fold the bag neatly. Once the bag is folded and contained inside its special pouch, it is only as small as a wallet. You can put it inside your purse or even your pocket. It definitely promotes the joy of going to the grocery store without holding or carrying anything. Lastly, these reusable grocery bags each have a squared off bottom to keep the goods in place. They can carry stuff with a total weight of up to 50 lbs. Their handles are long enough to be placed over the shoulder. On the other hand, for your personal use, check out our take on the best leather tote. Earthwise Deluxe Set of 2 Collapsible Reusable Grocery Shopping Box Bags are so big that their volume is four gallons each. They have a firm shape when opened, thanks to their heavy-duty recycled cardboard walls and non-woven polypropylene. Their form keeps them upright and open even when loaded. 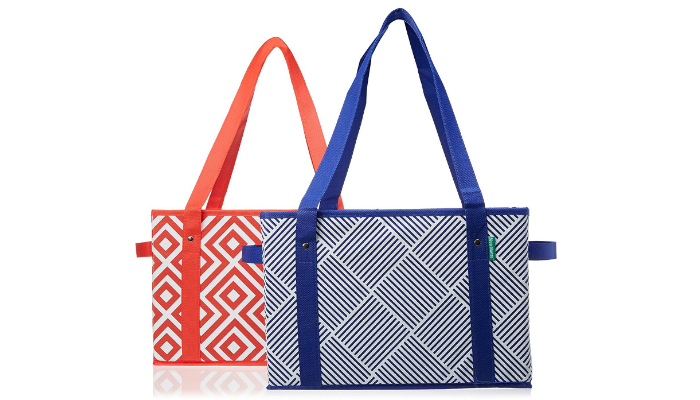 When it comes to storage, these reusable grocery bags fold flat. 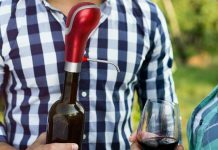 They are also perfect for laundry bags or regular containers whenever you need to go to concert events, enjoy boat rides, eat snacks on a picnic blanket or lounge on a beach chair. Simple Ecology Organic Cotton Deluxe Natural 3 Pack Reusable Grocery Bags focus on being environment-friendly through their biodegradable, organic and sustainable features. That is proven by their Ecology & Social Responsibility certification from Global Organic Textile Standard (GOTS). These reusable grocery bags have six pop-out bottle sleeves inside to secure tall products. Their design concentrates on meticulous stitching to ensure durability. 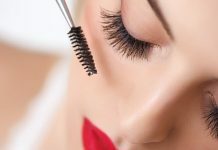 The different stitching styles present are piping stitching around the outer edges, X stitching at the handles, and double stitching on the top hem. 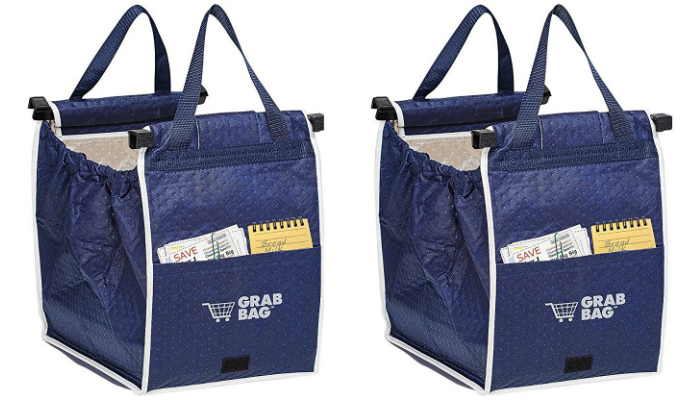 Telebrands Insulated Reusable Grab 40 lbs 2 Grocery Shopping Tote Bags take it up a notch with their insulated interior to preserve the hotness or coldness of food and drinks. They even have external pockets for your high-tech phone, product coupons, wallet, keys, and grocery list. They can be clipped to the shopping cart for ultimate convenience. These reusable grocery bags can also serve as trunk organizers to hold the groceries properly in a moving car. BahrEco Premium Washable Mesh Reusable Grocery Shopping Produce Bags are made to hold vegetables, fruits, and garden produce. 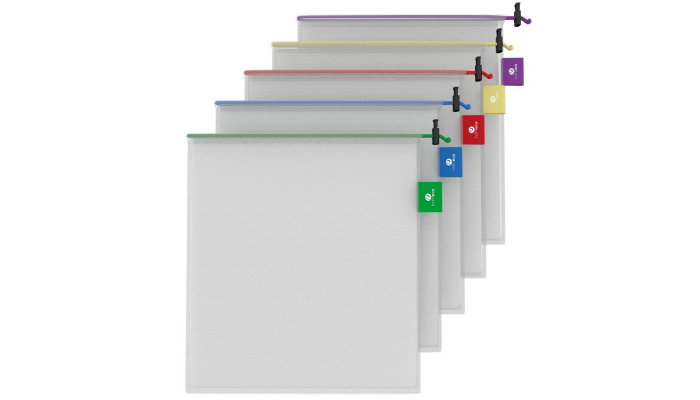 They have color-coded drawstrings and tags so you can organize goods such as tangerines, peaches, and avocados. 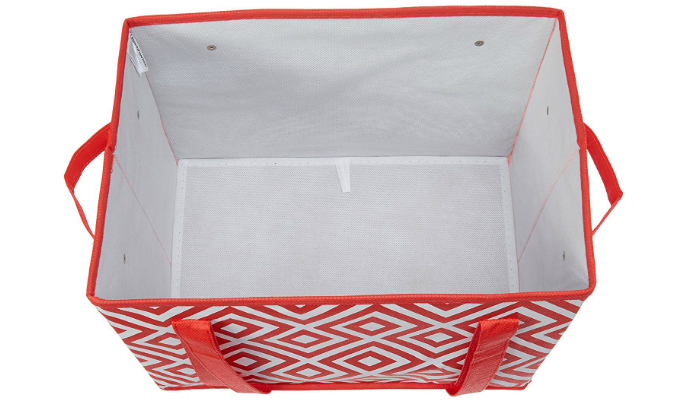 They can also serve as storage and travel bags for clothes, shoes, accessories, cosmetics, and baby toys. Their environment-friendly feature focuses on being free from any plastic material. Reusable grocery bags should be durable in order to last longer. Durability depends on the bag’s material, so you have to make sure that you are getting the right kind for your needs. There are many options that can help you decide which material to consider first. First is a popular material we all know – cotton. There are two types of cotton material: natural fiber and recycled. Natural fiber is organic or grown without the use of pesticides. It is a little bit more expensive compared to the recycled type, which is made from post-industrial reclaimed cotton. In general, cotton is breathable, washable and biodegradable. It is eco-friendly and durable but tends to wrinkle and shrink when you wash it often. Polypropylene is another common material that is a form of plastic. It is cheaper than other materials but durable. It can be made from recycled materials and even resist chemicals. Polypropylene may be woven or non-woven, which is less absorbent and easier to clean. The only disadvantage of this material is that it has plastic, making it non-biodegradable and harmful to the environment. Nylon and polyester are types of synthetic polymer. Both are lightweight, water-resistant, and strong. They compress easily and are resistant to crumpling. Like polypropylene, they are plastic materials that slowly breakdown or decompose. Lastly, there are grocery bags consisting of natural material. This type of material is usually from jute, bamboo or hemp. It is popular for die-hard environmentalists since its sources grew without pesticides, fertilizers and too much water. Hemp fiber is the strongest and most durable natural material. It can combine with cotton or polypropylene so that the texture of the shopping bag will be unique. If you prioritize durability and eco-friendliness, then natural grocery bags are the best options for you. Reusable grocery bags come in different shapes and sizes. Some resemble brown paper bags used in supermarkets while others have handles. 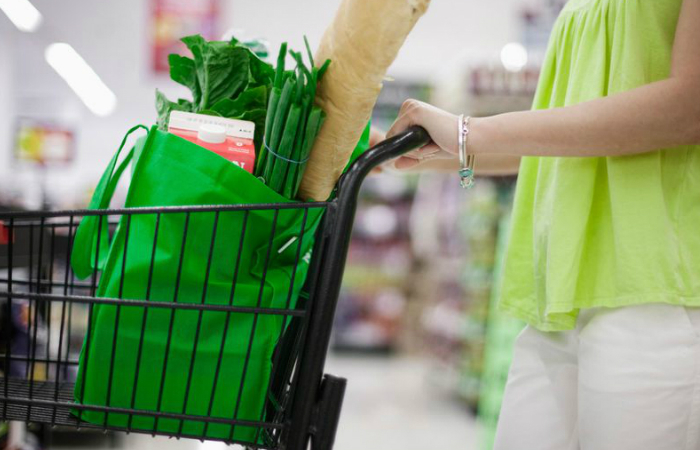 Regardless of the presence of handles, choose a grocery bag that is flat at the bottom and can stand on its own. The size varies from small to big bags. Small bags are compact so you can fold and place one inside your pocket. On the other hand, big bags are obviously more functional because they can contain a lot of stuff. Another thing to consider is the length of the handle. Some grocery bags have short handles like a handbag while others have long handles so you can carry them around like a shoulder bag. Make sure you pick reusable grocery bags that do not break easily when carried or used. When considering the style, think about the fact that you will carry the bag often around the store. The bag will get heavy in some instances. So, you must also prioritize comfort when you give importance to style. 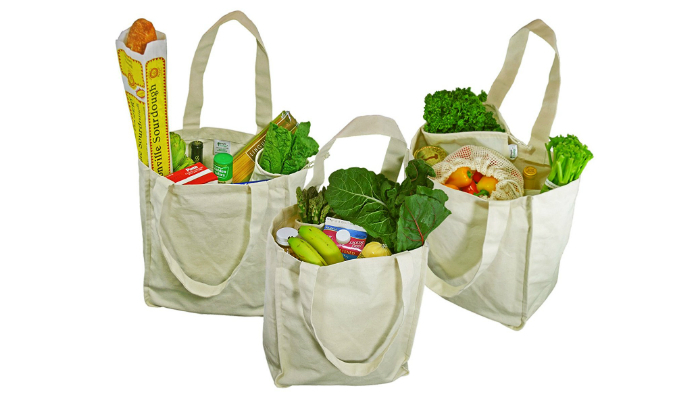 Other features to look into while choosing the best reusable grocery bag are gusset size, foldability, and insulation. Gusset size refers to the bag’s depth. Some bags have a wider gusset, making them perfect for heavy grocery shopping. Others are flat with no gusset to prioritize light use. Some bags can be folded into a pouch for easier portability. These foldable bags are very handy and ideal for trips in case of emergency baggage. Thermal insulation is in some grocery bags to keep food and drinks hot or cold while outside the house. Though very useful, this feature makes the bag cost more than regular ones. It is time to be more practical and do our part in the conservation of the world we live in. Let’s start by switching to reusable grocery bags every time we visit the supermarket. Just by doing this simple task, we are already making a big step for the environment.